A drawing of the head and shoulders of an elderly man in profile to the right, with an enormous jutting chin. Facing him is an old creature on a smaller scale, intended to be female, with a very long upper lip and a double chin. Melzi's 52. Around 1490 Leonardo studied human proportion, attempting to find the mathematical basis of ideal beauty. But by deliberately distorting these proportions, he could also create images of ‘ideal ugliness’. Here a fierce old man faces a vain old woman, her hair pulled back and bodice tightly laced, holding her hand to the man’s chin in a romantic gesture. 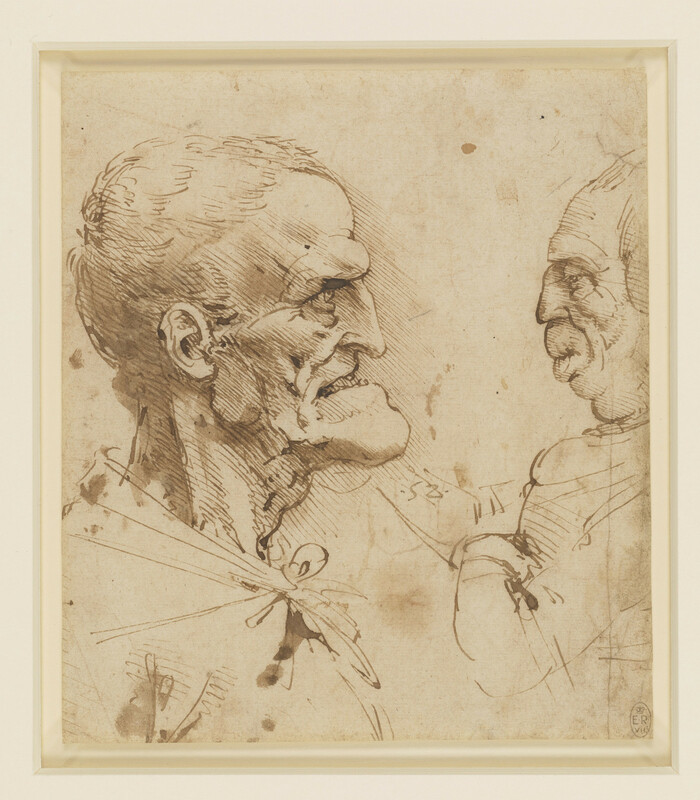 Leonardo thereby turns them into a pair of aged lovers, a parody of the paired profiles of married couples that were common in fifteenth-century portraiture.